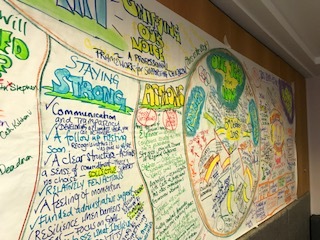 PATH is a creative planning tool that uses both process and graphic facilitation to create a shared vision of a positive future for individuals, families, teams and whole organisations. PATH draws on people’s ability to visualize different futures and to plan backwards from a future vision or dream and tell stories about how that vision can come into being. 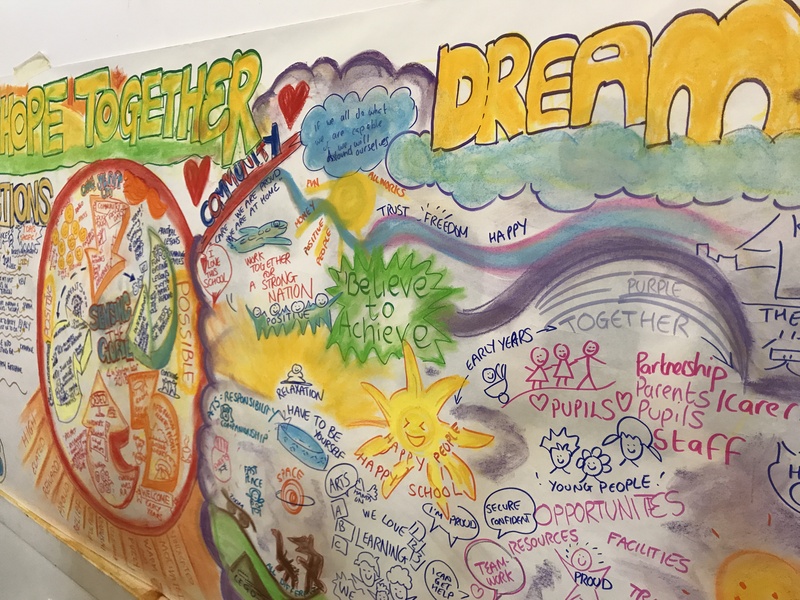 The PATH session will be led by two trained facilitators – a process facilitator who guides people through the stages and ensures that the person is at the centre throughout, and a graphic facilitator who creates a large graphic record of each of the steps in the PATH. There is a great Online resource from West Sussex Local Offer that shows how to build a PATH step by step with videos from Inclusive Solutions shown below and further information. Please click here to get to the website. There are 7 steps in the PATH process and it is rather like the facilitators are placing seven different sorts of ‘containers’ in front of the group and asking them to fill them one by one. A typical PATH usually involves a group of 5-10 individuals made up of the pathfinder (or focus person) and their family, friends and other professionals and support workers who know the focus person well. A PATH lasts for 90 minutes to 2 hours (possibly longer with larger groups). Each step in the PATH process has its own particular conversation associated with it. INTRODUCTION and SETTING THE GROUND RULES. ONE YEAR FROM NOW – ‘Positive and Possible’. In this step the facilitators ask the group to imagine that a year has passed since they created the vision. The conversation in step 2 is about looking back on the ‘past year’ and remembering what has been achieved in this time towards the vision. This is a more grounded and realistic step – we are not dreaming anymore. – All the stories and memories heard in this step need to be possible (they could actually have happened) and positive (we are only remembering the good times). Step 2 aims to give the group a better sense of what it could look like if they really were on track towards the dream. GROUNDING IT IN THE NOW – this step aims to create a tension between the vision of a positive possible future and where the pathfinder is now in relation to this future. The facilitators will ask you to talk about the facts and figures of the now. It is a conversation about where the group is starting from. WHO DO WE NEED TO ENROL – this step asks the group – ‘who will we need with us on the journey?’ towards the positive future – it is an opportunity for the pathfinder to invite those present to enrol in his or her future as well as committing themselves to that future. The facilitators will also ask the group if there is anyone who is not present who should be invited to join the group in the future and any names given are recorded for future invitations. WHAT WILL IT TAKE? – this step asks the group to identify and talk about what they will need to do (and not do) to keep focused on the path ahead – naming what skills and capacities they already have and can put to work as well as the relationships knowledge and skills they will need to develop. ACTIONS – this final step gets the group to identify bold next steps – both big and small that can be named now. The focus will move between things that can be done tomorrow and things that can be achieved in a week or a month’s time. The facilitator’s will push for specifics – the who, what, where and when of actions to be taken. Agreement will also be made on when progress will be reviewed. The PATH process ends with a round of words and reflections from the group on the work they have just done together and the completed PATH is photographed, taken down from the wall, rolled up and presented to the pathfinder. Interesting to listen to direct experience of this process? PATH is a powerful process – expect tears. Anna & Gail reflecting on the PATHs created for them at the West Sussex Person Centred Planning training in PATH, November 2016 led by Colin and Derek. Follow the link below to read a detailed thesis by Dr Margo Bristow on the use of PATH by educational Psychologists in the UK. The findings indicate that PATH impacted positively and pupils attributed increased confidence and motivation to achieve their goals to their PATH. Parents and young people felt they had contributed to the process as equal partners, feeling their voices were heard. Improved pupil- parent relationships and parent-school relationships were reported and the importance of having skilled facilitators was highlighted. Although participants were generally positive about the process, many felt daunted beforehand, possibly due to a lack of preparation. Pre-PATH planning and post-PATH review were highlighted as areas requiring further consideration by PATH organisers. Recommendations to shape and improve the delivery of PATH are outlined together with future research directions. Click here for a paper by Jack Pearpoint and John O’Brien on why they won’t produce a digital template for MAPs and PATH – makes some fundamental points about service centred vs. person centred delivery. Want one for someone you care about? Need one for your team? Call now on numbers below!